Canada is a great country – arguably I think we have it the best in the world here! Unfortunately for Canadian investors though, our Canadian stock market is poorly diversified. It’s dominated by financials and energy companies. In fact, as our big-5 or big-6 banks go (you know the names) and as various energy companies go (like Suncor, TransCanada, Enbridge, Pembina Pipeline among others), so goes our Canadian economy. Image courtesy of iShares Canada. While companies in this top-10 list are historically cash cows (who knows what the future holds? ), owning just 10 or 20 Canadian stocks does not make an entire portfolio for most investors. This is why we should consider investing beyond Canada’s borders. For almost a decade now, I’ve been building a dividend income machine that focuses on buying and holding a basket of Canadian dividend paying stocks inside my TFSA and non-registered account. Well, not only will my portfolio be able to withstand any major Canadian stock shocks, I’ll also take advantage of growth and income from the around the world. Pretty much exclusively, I hold my U.S. assets in my Registered Retirement Savings Plan (RRSP). I hold a few U.S. stocks and U.S. ETFs in my RRSP. 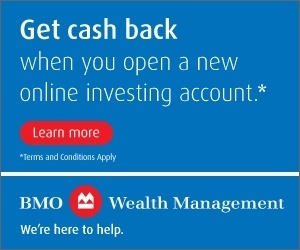 Because under our existing Canada-U.S. tax treaty, dividends from individual U.S. stocks or U.S.-listed Exchange Traded Funds (ETFs) are exempt from U.S. withholding tax (15% withholding tax) if the stock shares or ETF units are held in an RRSP or other registered retirement account, like a Locked-In Retirement Account (LIRA) or a Registered Retirement Income Fund (RRIF). You can read about how I manage my LIRA here – I have one. What is a RRIF? Should you convert your RRSP to a RRIF? Read more here. Back to the tax treaty, at this time, this treaty does not recognize our Tax Free Savings Accounts (TFSAs) as a retirement account (even though I definitely do)! So, the 15% withholding tax for U.S. stocks or U.S.-listed ETFs held within a TFSA will apply. You can read more about my investing approach using ETFs on this page here. No doubt there are more low-cost U.S. ETFs to consider. I do believe anything in this list long-term (meaning 10, 15 or 20-years) should suit you very well. You can also find most of these funds on my ETFs page – check out my top U.S. dividend ETFs to buy and hold for income and growth here. Canadian-listed ETFs (that hold U.S. stocks) have big benefits but also some drawbacks over owning their U.S. ETF friends. Here are three important considerations that come to mind. Currency conversions. Depending upon the discount brokerage you use, there could be a mark-up in converting Canadian dollars to U.S. dollars. By buying Canadian-listed ETFs that hold U.S. stocks or U.S. ETFs you avoid currency conversion headaches or work to “gambit” your money to U.S. dollars. An example: You can consider buying the Canadian fund VFV instead of buying U.S. fund VOO. More details about VFV below. If the value of your U.S. situs assets (e.g., stocks, bonds, ETFs, U.S. real estate, etc.) on death is > $60,000 USD, your estate representative must file a U.S. estate tax return regardless of whether there is an estate tax liability. Ouch. If the value of your U.S. situs assets is $60,000 USD (or less) at time of death, my understanding is you will not be subject to U.S. estate tax regardless of the size of your worldwide estate and there is no estate tax return filing required. Shares of Canadian mutual fund corporations that invest in the U.S. market (even if denominated in U.S. currency). Units of Canadian mutual funds, ETFs trading on the TSX or another exchange that invest in the U.S. market. American Depository Receipts (ADRs) – these are exempt from U.S. estate tax because the underlying share holdings are not U.S. corporations. Again, it’s complex and I’m not U.S. tax pro so I’m going to leave it there. If you Google U.S. estate taxes you’ll find tons of articles on this subject and potentially the details you are looking for. I found one very good one by RBC here related the information above. Again, not tax advice just what I understand! All this to say, if you have millions, you probably have more tax implications than just holding some U.S. ETFs across your portfolio. Withholding tax considerations with Canadian-ETFs. Yes, the withholding tax paradigm is tricky unfortunately. Essentially, there are no withholding taxes for U.S-listed ETFs inside an RRSP but when you hold Canadian-listed ETFs that hold U.S. assets, withholding taxes apply in an RRSP and TFSA and those are not recoverable. Exactly how much withholding tax are we talking about? You know about the 15% of the dividend withheld – so using Vanguard S&P 500 Index ETF (VFV) vs. VOO above as my example, say the S&P 500 via VOO yields closer to 2%. VFV withholding taxes = 2% yield x 0.15% withholding taxes = 0.30% extra costs to own VFV over VOO in addition to any MER difference. It should be noted in taxable accounts, VOO and VFV are all treated equally. Investors lose the 15% for withholding taxes still but they can claim a credit for this amount when filing their income tax returns. That sounds like another headache as well. In the end, buying Canadian-listed ETFs that hold U.S. assets is arguably a very small incremental cost to pay to avoid currency conversions, any potential U.S. estate tax headaches and more – but it needs to be mentioned here as part of your total portfolio cost. 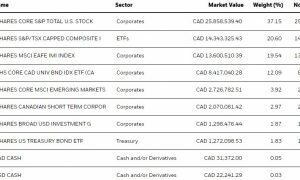 What are some of the best low-cost ETFs for the U.S. market using Canadian ETFs? No doubt there are more low-cost Canadian ETFs to consider but certainly anything in this list long-term (meaning 10, 15 or 20-years) should suit you very well. *You might recall the main problem for investors in buying the S&P 500 with any Canadians dollars is that you’re buying companies that trade in U.S. dollars. If the American-$$ weakens relative to the Canadian dollar your investment will be worth less. Conversely, if the American-$$ strengthens relative to the Canadian dollar your investment is worth more loonies and toonies. Essentially, there are two options available for Canadian investors with hedging: 1) be exposed to currency fluctuations (i.e., stay unhedged); or 2) be currency hedged. The objective of currency hedging is to reduce the effects of foreign exchange movements over the life of an investment. Personally, if you’re a long-term investor (I mean over decades), I would argue you want to stay “unhedged” and be exposed to changes in currency values. There are many, many important things to consider when investing in the U.S. market. I believe making such decisions ultimately it comes down to how much you are willing to invest; where you are going to hold those investments (i.e., in what account), are you willing to absorb the currency rate fluctuations over time, and grasping an understanding of withholding taxes for any investment you purchase. Once you have made these decisions – those decisions will help guide you into potential ETFs to own. Regardless of U.S. ETFs or Canadian ETFs that hold U.S. assets – keep your investing costs low and avoid trading. You’ll keep more of your money this way. Happy investing and I look forward to your comments on this comprehensive post. Do you own any U.S. ETFs? If so, why? Do you own any Canadian ETFs that own U.S. stocks or hold U.S. ETFs themselves? If so, why? Share your thoughts below. 50 Responses to "Great low-cost ETFs for the U.S. stock market"
Great point Ed. Having both hedged and unhedged may be the best of both worlds then for you! Nice summary of US stock ETFs and many considerations with them for Canadian investors. I choose unhedged with 2 of your choices above and US unhedged also with global ETF exposure. Unhedged = lower cost, great liquidity, no hedging disparities, convenient with a fair chunk of our spending in USD, and I like the idea of strong exposure to the worlds default currency especially for troubled times. Doing a norberts gambit is simple, fast and very cheap if conversion is needed. IIRC, last one was somewhere around .3% overall cost with a sizable trade. YMMV on all of this. Mark, I’ve owned a US etf in my unregistered years ago and IIRC the foreign tax credit claim was simply another box on tax form, with T5 slips coming from broker. No headache whatsoever. However the key issue as you’ve mentioned before is deciding where to hold US dividend paying equities outside of registered (preferable); considering less favorable taxes than CDN dividends in unregistered & 15% div. withholding loss in TFSA. That will be a decision I expect to have to make at some point in the future. Not going to have to “worry” LOL over the 11M US estate tax rules here. For 60K+ US assets with our estate no biggie, assuming its over that amount then. We retained a trust co. many years ago to handle executor duties. Hopefully we last for several more decades and who knows what rules will be then anyway. You’re right, not much headache with T5. I suspect you’re going to have a decision to make about your USD and CDN assets re: non-reg. I mean, a good problem to have. I don’t think many people “worry” about U.S. estate taxes although it is interesting that one must file a U.S. return with > $60,000 U.S. assets associated with an estate. People should consider visiting the Horizon’s Total Return ETFS and various flavours. Especially applicable in a TFSA if you invest in the major Markets (USA) for QQQs, SPY etc… With SPY thare are 3 versions covering the the equivalent, $CAD, $CAD Hedged and $US. No withholding at all (converted by 3rd party, swaps etc.. )and no distributions, selling incurs Capital gains only. Great for individuals where clawbacks occur based on understanding of marginal tax rates etc. These are super products and a very creative approach. eg) OAS clawbacks, GIS etc…. no need for T1135 reporting. Another option for sure Chet I didn’t cover but I could have. The swap-based nature of some Horizon’s ETF help defer gains, as I understand it, until the asset is sold. These can be tax-efficient products for folks investing in a non-reg. account don’t you think? I have some USD coming my way that I’d like to keep in same currency but only have a non-registered account for the funds as RRSP and TFSA are maxed out. Good problem to have I guess. I’d like to put it into a US ETF. What would be the best way to minimize tax? Should I look for all capital gains approach? From a tax-perspective, focusing on stocks in a non-reg. account that either pay CDN dividends that are tax-efficient; and/or, focusing on ETFs and stocks that pay no dividends and therefore focus on capital gains would be a consideration. Those are just my thoughts of course but other readers might have more suggestions given I know some of them also have non-reg. assets. Thanks Mark. Yes a great problem! I do want to keep the funds in USD and not convert to Canadian so I think that would rule out CDN dividends wouldn’t it? I appreciate any responses! Again, not advice, just some considerations! There are certainly also U.S. ETFs that pay their distributions in USD $$. Hi Mark — certainly excellent in non-reg but also in TFSA as the swap includes no US withholding as the entire “distributions” are added to your ACB. Indeed Chet. All the best and thanks for being a fan. A few have asked about the total return ETFs from Horizon’s – it might be worth updating your great analysis with a call out for HXS. The MER is okay (0.10%) but the TER of up to 0.30% offsets any savings in withholdings tax drag, and you are exposed to potential capital gains liability if the Feds decide to disallow swap-based products. Since yields are normally lower on broad-based US ETFs than Canadian indexes, in my taxable account I use VUN (for which dividend withholding taxes apply but are recoverable) but use HXT for Canadian exposure. When I retire, plan to manufacture my “dividends” by selling chunks and paying capital gains taxes rather than dividend taxes along the way. Thanks Bart. I’ve heard from a few retirees who are planning something similar: create their own dividend income by selling off chunks; paying capital gains taxes rather than dividend taxes along the way – since that is an efficient use of taxation. Bart – what is your drawdown strategy if I might ask? i.e., kill of RRSPs, then taxable, then TFSAs? Other? Curious how you might wind-down the portfolio over time to be tax efficient with ETFs like VUN, other. I’m still a number of years away from drawing down – I’m in my early 50s now, financially could retire between 55-60, but actual timing will depend on factors like how work is going (balancing stress vs. interest in my work) and my wife’s situation (retires as early as 56 as a teacher). Unlike my wife, I have no pension and have had to figure all of this out (not only did she not have to learn how to invest, allocate, navigate taxable vs. sheltered accounts; she also doesn’t have to figure out drawdown strategies!). Fortunately, I’ve done a lot of reading on drawdown scenarios both here and in resources like Darryl Diamond’s books. My plan is to draw down my RRSPs first, which will be aided by delaying CPP to age 70. That will mean any RRIF from left over funds won’t be that sizable, and I can use taxable amounts to top up if need be. My recent reading on OAS suggests taking it at 65 rather than delaying, so drawing down my RRSP beforehand would make sense to avoid clawbacks. Any shortfalls along the way will be made up by selling off portions of my taxable investments. TFSAs would be last, if needed at all (we’ve lived under our means so long that it’s become ingrained). Things could change along the way, and I’m always learning, but this plan seems logical to me. Would love to hear your opinion or others’. One other point I wanted to make in relation to this and the initial discussion on US ETFs, I have been using guides like these to help me decide on asset location (what belongs in what kind of account). That works great during your accumulation years but becomes a problem in draw downs. If your RRSPs mainly hold international and you have your Canadian and US holdings in taxable accounts/TFSAs, to keep your overall balance as you draw down your RRSPs you would need to sell some of your taxable holdings (triggering capital gains) to purchase international holdings. For my remaining working years I’ve been wondering if I should purchase the portfolio ETFs (e.g. VGRO) in my taxable and RRSP accounts to smooth the eventual draw downs. I’d love to hear your thoughts on how to structure portfolios with draw downs in mind. Portfolio allocations aren’t as simple as avoiding withholding taxes!! What about XIU for taxable? It’s VERY tax efficient, you are essentially guaranteed 3% yield/distributions every quarter – it is available for the CDN dividend tax credit AND you don’t have to hold stocks directly, you hold the top 60 indirectly and never have to worry about re-balancing? Not advice, just something to think about. Then, you can use a cash wedge for riding out bad markets, you have your wife’s big bond (pension) so you treat that like fixed income and you can keep your RRSP/RRIF for U.S. and international asset allocation. Conversely, you can always use this post to consider holding CDN listed ETFs that hold U.S. assets and international assets in your TFSA and RRSP if you are ever worried about asset allocation to U.S. and beyond. Excellent point about XIU – I will consider that. I am using index ETFs across all accounts and the dividend payout and generally good quality companies are pluses (HXT is the TSX 60 too). I have XEF and XEC in my RRSP (and a bit of VUN too). I view my wife’s pension as a big bond. My own portfolio is 100% equity – I rode 2009 down to market value being half my book value – I wasn’t happy but I rode through it with no real anxiety, so my risk tolerance has been proven to be high. I plan on being high equity all the way through retirement. HXT is also very tax efficient but the challenge I have with it is you have to sell shares to create your dividend income – therefore you have transaction costs. With XIU, collect and spend the distributions and no transaction fees. I own most of the top-20 to top-30 stocks in XIU outright so essentially I have the MOA XIU ETF. Smart to consider a DB teacher’s pension as a big bond. This way, as you say, you can take on more risk with equity over time and get higher returns than bonds over time. Good point about transaction costs selling off chunks of HXT. I figure that will be a long way off for me (after RRSPs draw down) and I figure I’m saving the taxes on the dividends along the way for now, so it might be a wash. I would expect to sell larger chunks a couple of times a year rather than monthly. I am also thinking of shifting to dividend paying instruments when I’m no longer working FT. Ya, if you are only selling one or two times per year, for HXT, other swap-based ETFs for generating your income then no big deal really. I guess I’ve always gravitated to a dividend-like/dividend-oriented ETF such as XIU (there are others, ZDV, etc.) because they are both tax-efficient and provide income so you don’t have to sell ETF units – but can do so at your discretion. One thing I might suggest Bart is to consider how much income your TFSA will be generating for the time periods you look at not just their value. At your current age, you have many years left to contribute and grow those plans. Conceivably, even with a relatively conservative investing approach, your TFSAs can generate tens of thousands per year. Between those funds, CPP, OAS and your wife’s pension (keep in mind survivor amount just in case), it seems to me you may be in a fairly sweet spot. Also keep in mind that the current general drop out provision for CPP calculations I believe is eight years. Seems BB is in a very good place financially with an alphabet soup of accounts to consider for drawdown. Anytime I hear of an investor with an asset decumulation problem, I think about the fact they’ve had a very good path to asset accumulation. Well done to you and BB and others on this site. @BB, your situation sounds similiar to here although I’m retired nearly 5 yrs now. It sounds like you’ve a good idea of how you’ll do things that seems solid. Financially it seems you’ll be in a very good place and with choices = excellent. You’re ahead of me because I had waited until retirement to start thinking seriously about retirement cash flows, asset allocations by acct etc. Since retiring have done much study & thinking on this, including D.Diamond-3X now, but its a work in progress! I agree with Lloyd re survivors consideration (we have some life insur on my wife re this for 5-10 more yrs) and add to consider your wifes pension bridge loss. Below is our situation FWIW. We top up TFSAs & also contribute small amount to unregistered-100% CDN equities annually. Probably will continue both until CPP-likely age 70. OAS probably hers @65 to offset most of pension bridge loss, and good chance mine then too. At current withdraw rate registered will last into mid 80’s+ – LIF mid 90s-might step these up depending on market outcomes next few yrs. Challenge is how to maintain global equity & FI/EQ allocations, how much to spend vs take to grave, confirming govt benefit dates, smoothing of taxes. Am thinking of moving CDN equities from TFSAs making room for foreign equities to replace registered over time. You’re a few years ahead of me BB, I’m 45, but I too have started to think about asset decumulation. We figure with the path we’re on, part-time work at age 55 is almost a certainty as long as we work full-time in good jobs until then. For your wife, that pension is a huge, BIG bond – great for fixed income. I can appreciate the work you’ve done to read about how to invest, allocate, navigate taxable vs. sheltered accounts; etc. Diamond’s book is great and I should buy a few copies this year to raffle it off. I will probably do that…. -plan to keep a ‘cash wedge’ of $50K in savings as emergency fund, ride out bad markets. The key for me is to figure out, like you with your wife, the combination lock of using all those accounts in a tax-efficient manner while delivering the desired needs and wants in retirement. I have a few case studies in mind to work with, with a CFP in the coming months. Stay tuned for this site because those case studies might help out. That said, I think our withdrawal strategy is likely RRSP then non-reg. then TFSAs. The TFSAs will be “until the then” while deferring CPP and potentially OAS until age 70 with my DB pension. This way, the older we get, the more pensionized our income and then the less money management to worry about in 70s and 80s and beyond. Big thanks Llyod, RBull and Mark, I appreciate your comments and encouragement. I guess we’re in a good position and I agree that when you have RRSPs, TFSAs and taxable accounts and are worried about draw down issues, it’s not a bad position to be in. In some ways, it all sort of happened, we went from student poverty to saving for a down payment poverty, to paying off the mortgage early and raising kids poverty. We were good savers have been debt free for many years and never fell into lifestyle creep that undermines others. But I know we missed opportunities to enjoy life more so there is a trade off to consider. 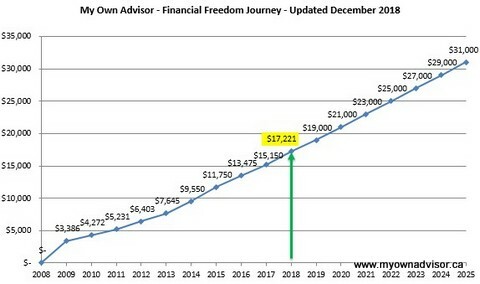 I had a terrible advisor early on and that inspired me to embrace life long financial learning, which I enjoy a lot, even though my indexed portfolio is hardly innovative. The benefit is that in our 50s we have choices, particularly in terms of how long I feel I need to keep working — some days its great, other days it’s tough, so for me, accumulating assets was all about freedom to choose. For about 5 years (when I was your age, Mark) I’ve been paying attention to draw down topics and have been focusing more intensively recently and feel good about our plan. I’m very much looking forward to reading your upcoming case studies! I enjoyed the one you had a few months ago and l like reading the financial face lifts in the Globe and Post. It certainly sounds like, despite some mistakes – geez – who doesn’t make those – you are very well suited for any retirement BB. This is the motivation I now have to also accumulate assets – so in 5-10 years I can choose as well. Yes, I’m going to do similar case studies like the Globe and Post but probably focus on “the whys” more in any drawdown plans. I feel there is direction in those Globe and Post articles but in some cases, there is not very much explanation. Bart, you’re welcome. You’re in good shape and studiously well prepared it seems. Indeed, being able to choose is fantastic. We “suffered” from lifestyle creep. Doesn’t matter. All is good. It struck me of the 4 people involved in this conversation 2 are retired and 2 are planning retirement. The 2 retired were 100% equity throughout their savings years and may have ridden through even more market bleak periods being older and being early investors. In retirement they changed (not originally planned-at least me) and now have large blocks of fixed income assets, and also have at least one “big bond” pension in the household. The two not yet retired plan to stay 100% equity. It will be interesting to see the if perspective for the two planning change with regards to 100% equity if after having gone full stop being employed. Speaking for myself I suspect a difference may be you two are probably better prepared with strategies for the decumulation. I was hell bent on protecting capital from my readings that the first 5 years of retirement were critical to long term financing of a retirement. I therefore went into a much more defensive posture with FI and with equity types, and also considering we were starting retirement after a 5+ year bull. It seemed likely we would have been “hit” before the years. As it happened we are nearly at the 5 year window now, and we seem to have lucked out -so far. As you know I have been evolving our equities to more income oriented and slowly raising the equity stake. I can now more clearly see our spending patterns/needs and how assets currently + pension give us a large cash flow needs cushion. Probably positioned safer than needed but I think any further change will need to be precipated by some notable change in markets, and as we near some more govt pension benefits. Hindsight is a wonderful thing but would be better if it could somehow assist crystal balls. Mark you have been a model of consistency with your plan since I started reading this blog and from the bit BB revealed it seems he’s well disciplined and planned too. That was an astute observation RBull – I’ve been influenced by my father who at 80 has been 100% equity all through his retirement (well, he has a small pension, CPP/OAS), and my farmer grandmother who owned dividend paying stocks in retirement. I may wind up creating a fixed income ladder equal to one or two years of drawdown in a HISA so if markets tank I can just wait them out. But you are right, I may decide that capital preservation is more critical once I’m there. It’s funny, almost my whole working life was focused on capital accumulation. I didn’t realize that was the “easy” part – draw down decisions are more complicated! I’ve also been changing my thinking about what retirement is – no longer a goal or finish line, now I need to figure out how I will spend my time each day once I get there. Again, lots of options are available, but as someone who has always been a planner, I need to figure that out too. That’s also astute for you to recognize ahead of time that draw down is the hard part. IIRC correctly Mark has mentioned this before too. I can confirm its true. Accumulation easy, keep head down working, eliminate debt, save to the max possible, invest it right away in your chosen stocks or funds for the long term. Rinse and repeat. Now there’s numerous moving parts to determine and create cash flow / amounts with different accts & investments, tax considerations, capital preservation/sequence of returns considerations, and fortunately reinvestment decisions (from registered to TFSA and/or unregistered etc.) And of course enough time set aside to plan our next trip. LOL Once again, lucky to have choices. Totally right retirement isn’t really a destination. It’s just a different fork in the road of life that you keep traveling. Having some goals, plans, hobbies, social contacts and staying mentally and physically active/engaged are definitely very important for happy retirement. I read numerous books and then made myself an activities ideas list, and a bucket list for travel and activities. I’m working through them and now into some volunteer stuff that I’ve been away from for about 10 years. Makes sense on the HISA/cash wedge to get you through some potential rough patches if its ever needed. With teacher pension, HISA and fixed income we could weather ~12+ years at retirement to date lifestyle+inflation without touching dividends or equity capital, or considering future OAS, CPP income. Perhaps over safe and I’m considering all options. I’ve read many articles, FWIW BartBandy, that suggest as you get older – beyond a cash wedge, and any pension you hold as a bond – you should actually consider increasing your equity exposure. While more volatile, the growth component is there long-term and that fights longevity risk. For sure, asset decumulation is far more complex than asset accumulation. I hope to provide a handful of case studies in 2019 on the site with a CFP or two so we can demonstrate via examples some things prospective retirees should consider. Lots of options = retirement = great problems to have even for planners. From what I’ve read on this site RBull – with one good pension as your base income, and even just spending the dividends from your portfolio – you will actually never run of out of money short of an apocalypse! You were probably very conservative given the recent financial crisis entering full-on retirement. Most people would be the same way. But now as you say, your spending patterns and needs are more clear I suspect you’re biggest issue is a tax problem; meaning trying to minimize taxes for the coming decades as you draw down your portfolio as you please. An awesome place to be in and something as you know I aspire to. I appreciate your confidence Mark. Not sure its quite awesome but we’re lucky and thankful to be in okay shape so far in retirement. As for aspiring I think all things considered you’re a lot closer to that place than you may allow yourself to think. That’s fair on taxes being a key consideration. How much to withdraw now, how much to spend or reinvest, what is impact on current and future taxes, and govt benefits. It has more challenges than I anticipated for someone that planned to spend capital and endorses VPW. A bit of a paradox. However Mr Market may also fix that for us in the next year or two. Thanks Mark, great post and look at the ETF range. You’re right, owning 10 Canadian companies does not a portfolio make, ha. That’s why I only hold 7. 🙂 While I’m an indexer at heart, this is certainly where I go offside, perhaps. I’m skimming the tsx 60 and the high div funds, but do I have enough? 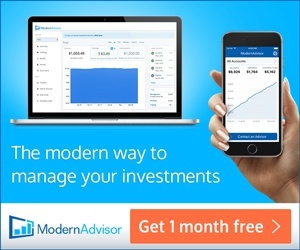 I simply got here by experience due to holding them over the many years mixed with ETFs. I admit to being in and out of the banks and telco’s but realized had I just held them, they would have beat the market with lesser volatility. So I went back to that 7 pack. Will they continue to beat the heck out of the market? Who knows. I simply thought my 7 had the greatest wide moat. Banks. Telco’s. Pipes. The most important part is patience and consistency as with any approach. I do not expose my wife to that same concentration risk. We use VDY Vanguard for her. That has a nice little 1% annual beat over XIC. Ha, I recall another reader here (cannew) owns about 12-14 stocks in total, all Canadian, and that’s it. He’s pulling down something ridiculous like almost $100K in dividends per year from that portfolio. So, is diversification over-rated? It really depends what you own and your behaviour with those stocks I guess. For cannew, I recall he’s killing it in his mid-70s now. I’ll let him clarify that in future comments when he’s here. I don’t mind VDY for an income play but for diversification and the fee, for the top-10 that make up what, about 70%+ of the fund assets – I figure you might as well own all 6-7 CDN banks, all 3 big CDN telcos and a few CDN pipelines directly. Which I do. Any plans to unbundle the VDY at some point and save the MER? For US we skim 15 of the largest cap Achievers, plus 3 simple picks. You mention VIG Dividend Achievers in your list. That’s a great index for better risk adjusted returns IMHO. Especially useful for those retires and near retiree types. Thanks for your comment Dale – I’m curious of what you hold for your U.S. Achievers. ? I own what many dividend investors own (the usual suspects include T, JNJ, PG) but it seems like as I get older I’m gravitating to more low-cost ETFs for the RRSP. It simplifies my life and still provides the income I need/desire. VIG is great, as is VYM, HDV and a few others. Given that I was approaching my semi retirement I used VIG and then the skims. Here’s the article that lists the 15 stocks. I skim that index for the potential of lesser drawdown through a major the correction. I hold 9 Aristocrats in that mix. I also have three picks, Apple, BlackRock and Berkshire. I’ve done a lot of study on risk and comparison between dividend growth and broad market. Yes 10 might not be enough, but here’s the original top 10 Achievers vs Market through the last recession. 10 companies with 2 financials through a financial crisis, should not have worked, but it delivered better risk adjusted returns for several years, and lesser drawdown in the correction. Apologies for the blogger bomb, throwing in article links but that’s was the most efficient to ‘explain’. One can follow Ploutos on Seeking Alpha for history of Aristocrats. I personally do not own any US ETF now especially those that are index based ETF. This is because the indices are trending downward and is pointing to a bigger drop. Exactly, when that will happen nobody can tell but if you look at the charts warning sign are all there. Thus, I have a large of my portfolio in cash/MMF 30-40 in my RRSP and almost 90% of my DC Pension is in MMF. KHY, cash goes backwards. You’re right, nobody knows what will happen. I don’t know of any successful market timers 😉 All the successful investors I’ve come across exhibit legendary patience and consistency and stay in the market. There are definitely signs stocks might be headed lower for a bit but I don’t know that for sure – so I simply keep buying more assets over time and stay invested. Always interesting to see where things are going! I would agree with Dale Roberts and Mark. Market timing = impossible. Trying to be right twice – timing when to get out and when to get in sounds good but no one can do it. Seems like you need to pick an asset allocation you’re comfortable with and keep investing for the long term, if equities only bothers you. A broken clock is far easier to tell time than to try and time the market. I don’t even bother. I buy when I have money to invest and I keep it invested. Boring can work wonders over time. Good plan. You have lots of years ahead to benefit. Hey Paul, thanks for the email. It’s hard to say from a return perspective Andrew, both are S&P 500 Indexed funds, similar MER but I think they should be very comparable.